This book starts with teaching us that “Many of the same anxieties and self-protective reactions that were caused by early sexual abuse are rekindled during pregnancy, maternity care, and parenthood, perhaps more that during other periods in life.” (Pg xvi) In the foreword by E. Sue Blume there are many nuggets of wisdom that show the above statement to be true. “Pregnancy vindicates the truth of memories of childhood sexual trauma. The survivor may not remember her abuse, but her body tells her story.” (Pg xxi) Abuse Survivors have been taught that she can not trust her own perceptions, she doesn’t have a sense of her own empowerment or boundaries in her life. This often brings up negative feeling about themselves as they are in adulthood. The overwhelming strong theme in this book is treating survivors (all birthing women-all women- all people) with respect, dignity, and involve them in all decision making. The ways that this can be seen is so important for us to know. “Numbing out”, hypervigilance or hyper-alertness, an obsessive need to maintain order and predictability in their lives. The four broad categories seen in childhood that could be indicators of sexual abuse if unresolved can present in more adult forms including bodily complaints, medical problems, changes in personality, self-destructive behaviour, thoughts of suicide, phobias, psychological disturbances, sexual dysfunction and difficulties in relationships. We must recognize that many illnesses have emotional and physical components. And that chronic severe childhood abuse results in alterations in brain development. Childhood sexual abuse is listed as one of the possible causes of post-traumatic stress disorder by the American Psychological Association. As pregnancy is a challenging time for some survivors, labour and birth are the “climax of the entire process.” Many of the events of labour and birth bring up lack of control, fear and uncertainty as well as the actually procedures and routines that are commonly done. The book goes into detail about the procedures and how we can reduce the chances of triggering these women using explication, kindness, communication skills and respect. We know from Penny Simkin’s other work that this period of time can be remembered for the woman’s lifetime. Then the book moves on to the postpartum period. With the enormous changes in the women’s body, emotions and her relationships can be overwhelming for the survivor. It shows how negative self-image, fears, higher risks of problems with physical health etc can effect this time as well of course with how the birth is perceived by the woman. Postpartum mood disorders, ptsd and breastfeeding challenges are also discussed in a respectful way. Part II: Communication, Help and Healing. These chapters offer so much wisdom, insight and practical advice for the woman herself and for doctors, midwives, doulas, nurses, childbirth educators, breastfeeding consultants etc. It explores the power dynamics, “survival” instincts, safety, and again reminds us the regardless of our knowledge of sexual abuse empathy, kindness flexibility, listening skills and respect are what is needed for every woman. As well as suggestions for survivors for good communication with her care providers. I think I highlighted the entire chapter on communication skills! This is such a missing thing in the North American culture. Directive and non-directive communication is clearly defined and given guidelines on how to use. How to allow the woman to feel heard, validates and understood! As well as benefiting the care provider as well. “For the victim of childhood sexual trauma, the child birth experience can take on the three directions in the healing process: a negotiate direction, a neutral direction or a positive direction” (pg 124-125) How to appropriately react to a woman disclosing sexual abuse is also discussed which is such an important piece. There is helpful tips and insight for different professionals (childbirth educators, doulas etc). How what is “normally” done can be triggering and how to see things through the survivors eyes. Many practical ideas and thoughts for supporting women and questions that the women themselves can consider. Our understanding about the impact of early abuse can make such a difference to these women. Psychotherapy goes much deeper than the scope of the birth worker and dives into wonderful information for the therapist. The last section of the book- part III: clinical challenges and solutions is filled with practical information! Such great team approach, informed dedication making and flexibility strategies. 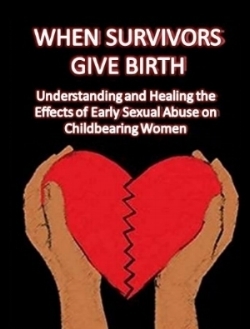 The primary goal of this book is listed as “to provide practical information and guidance to survivors, their healthcare providers and psychotherapist to minimize or eliminate the negative impact of early sexual abuse on childbearing and parenting”(pg 284) I believe this book has met its goal.